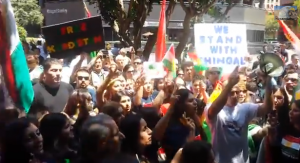 On August 11, hundreds of Kurdish-Americans held a rally in front of the federal building in downtown San Diego chanting “We love freedom” and “God bless USA” to show appreciation for President Barack Obama’s decision to launch airstrikes and humanitarian aid in their homeland. 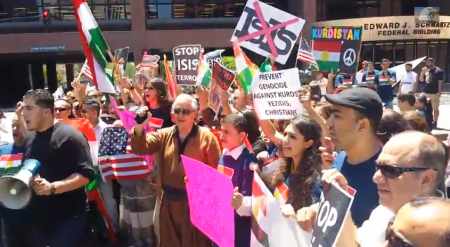 Many held signs denouncing ISIS, the Al Qaeda splinter group that has declared an Islamic state or caliphate across Northern Iraq including the Kurdistan province. Other signs urged, "Free Kurdistan!" The majority of those in this area are Yazidi Kurds, though there are also thousands of Kurdish Muslims. The Yazidi religion dates back to ancient times, before Christianity. Ordered to convert or die, they have been subject to atrocities, major news outlets report. The U.S. has begun dropping humanitarian supplies to those trapped on the mountain who face slow death due to lack of food or water. Over 100 young children and elderly people have already lost their lives from hunger or thirst. In addition, the U.S. has launched at least 17 airstrikes against ISIS forces, taking out artillery that ISIS used to shell the area. U.S. bombings have helped to stop the advance of ISIS and enabled thousands of trapped Kurds to escape. But the air strikes have not done enough to help those trapped on Shingal Mountain, Amina believes. “The U.S. can do much more,” she says. Although Kurdish Syrian and Peshmarga forces managed to clear a narrow rout from the Kurdish region of Syria to Shingal Mountain after three days of effort, she reports, “this route is still not safe because ISIS can still shoot them from a distance” at rescuers trying to free those who are trapped. Like many Kurdish-Americans, she wants the U.S. to provide arms directly to the Kurds, though official U.S. policy is to route arms through Iran. But Iraq has not provided any weapons to the Kurds, says Amina. The Kurdish people have long faced persecution, from the Ottoman Empire a century ago and from Iraqi dictator Saddam Hussein, who gassed the Kurds before he was deposed during the U.S. invasion. Now the persecution by ISIS has once again caused Kurds to flee into the mountains. Massoud Barzani, the president of Kurdisatan, has appealed for international military help, CNN reports.In addition, Barzani has asked the Parliament to hold a referendum calling for Kurdish independence. Amina predicts that over 95% of Kurdistan’s people will vote for independence. San Diego has one of the largest populations of Kurdish people in the U.S. and many of them live in East County. Often, they came here not speaking any English, but have assimilated as has Amina, a succesful poet who attended Grossmont Community College in El Cajon and later graduated from San Diego State University. dig the soil and plant seeds of peace. and birds huddled on gray.